Regular guest blogger Alan Jessup-Peacock is delighted with an upturn in Concord Rangers’ form. Some of you may remember I recently wrote about a kind of home game hoodoo that concord Rangers were suffering from? The team had not won at home in the league, and when away from home the team were playing with more freedom to pick up the victories. I remember asking what the problem was, and hoping that it was overcome very soon! Well I didn’t have to wait too much longer to see my wish come true! The first game after my last article was actually a home game in the FA Trophy Qualifying, and that day saw the Beachboys fall 0-2 against follow Ryman League side Enfield Town, but thankfully that was the last loss that Concord have suffered since then! November has been a month of victories for Concord Rangers, and even more so a month of goals, but I’ll come to that shortly. Saturday 3rd November saw the Beachboys have a tough trip to Harrow Borough in the league, and on a personal note I was hoping for 3 points as it was my birthday that day (selfish I know). Concord took the lead early in the 2nd half through a Nicky Cowley header after a scrappy yet uneventful first half. Harrow fought back & capitalised on a Spendlove mistake to equalise, but Concord were not to be denied another away win when all was said and done. Adetayo Osifuwa took control of a high ball in the Harrow box late on before being bundled over leaving the referee pointing to the spot. Harry Elmes calmly slotted the ball away to earn the Beachboys the full 3 points. The big loss though was when John Easterford put his body on the line to thwart a late Harrow chance; he walked away with a deep cut under his eye and a suspected broken nose. Then came the run of home games, 4 matches at the Aspect Arena in a row, including an Essex Senior Cup match as well. First up were league leaders Hampton & Richmond, and this was going to prove to be a tough game. The Beachboys though were up for the game with nothing to lose, touted as heavy underdogs. It may not have been the warmest night down Thames Road, but the game warmed me up that’s for sure. Six minutes in, Harry Elmes turned in an uncleared free-kick to make the most of the early pressure Concord were putting on the league leaders. More chances fell to Concord, but the first half ended with the score still 1-0 to the hosts. The second half was dominated by one major highlight courtesy of Reece Harris. Concord won a free kick just outside of the H&R box, Harris stepped up to take it with bundles of confidence, and rightly so as he curled the ball right into the top corner of the goal. The Beachboys were over the moon, as were the home support, at the prospect of picking up their first home win of the season. The Beavers grabbed a late consolation goal, but Concord were not to be denied! That was a huge win for the club against a newly promoted team who were flying high in the league, and it prompted a run of games which have instilled a new confidence into the team, a deeper sense of belief, and a realisation that the hard work the lads have put it is paying off. I mentioned November was also a month of goals, and it really kicked into gear the Saturday after the Hampton & Richmond game as Concord took on Carshalton Athletic in a rearranged league match. I could go through all the details but there were so many things happening it was tough to keep up! Concord Rangers played a belter of a game, winning 6-3 on the day! The goals continued to flow the following Tuesday at home to Takeley in the Essex Senior Cup. This game came about after original opponents Aveley fielded an ineligible player in the last round, but Takeley couldn’t make the most of their reinstatement to the competition on the night. The Beachboys dominated the game, winning 8-2 at the Aspect Arena with Jason Hallett scoring 7 goals! Goal machine Jason Hallett has scored thirteen goals in two starts! If supporters thought that was as good as it gets, things continued to get better for the Beachboys as they hosted Met Police this past Saturday in the league, coming up against former player Chris Bourne. Although Met Police took an early 1-0 lead, Concord were determined to continue their good run of form and fought back to win 5-1 on the day. Tony Stokes knocked in a hat trick, culminating in a spectacular overhead kick which reminded fans of the goal Zlatan Ibrahimovic had scored for Sweden against England midweek. Jason Hallett had started that game on the bench after his goal-fest midweek, and that must have lit a fire underneath him as he came out firing again this past Tuesday night. Concord were drawn away to Redbridge in the Ryman League Cup, and I honestly can’t do this score line justice with words, the Beachboys won 9-0. This included a double hat-trick for Jason Hallett (13 goals in 2 starts), 2 for Tony Stokes, and a first senior goal for Sammy Knott, a great young prospect at Concord who has just returned from a long-term injury. So things are on the up for Concord Rangers, some fantastic victories coming their way as a result of a lot of hard work and perseverance. The club are 7th in the league, 4 points above the noisy neighbours, and are in the draws for the 4th Round of the Ryman League Cup, and the Quarter Finals of the Essex Senior Cup. Yes there’s a lot of football left to be played, but the optimism is high down on Concord Island right now! Maybe we can make Thames Road a fortress again? 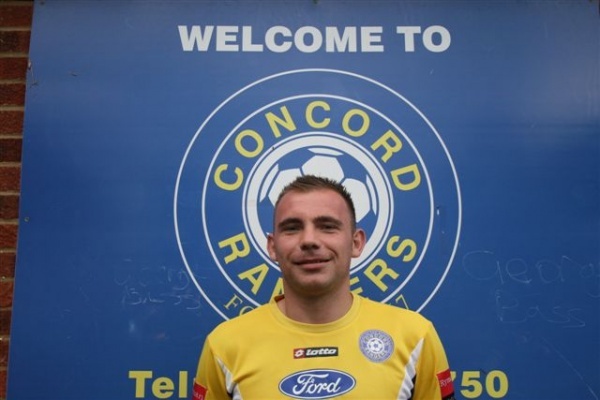 Posted on November 22, 2012, in UTL Archive and tagged Concord Rangers, Isthmian League, Isthmian Premier, Jason Hallett, Ryman Premier. Bookmark the permalink. Leave a comment.